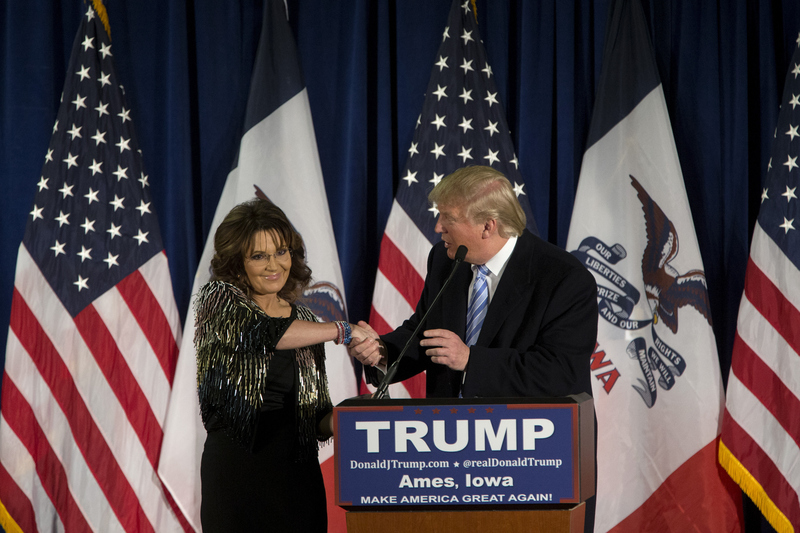 Sarah Palin vaulted herself back into political relevance on Tuesday by endorsing Donald Trump for president. In a high-energy speech seemingly influenced by slam poetry readings, the former half-term governor from Alaska sang Trump’s praises in front of an Iowa audience, calling him “perfectly positioned to let you make America great again.” Palin’s unexpected return to presidential politics is fascinating to watch, and it says just as much about Trump as it does her. Palin enjoyed a swift rise to national prominence in 2008, when John McCain picked her to be his running mate, but her fortunes declined precipitously after she and McCain lost the election. First, she abruptly resigned from the Alaska governorship to take a gig on Fox News. Then she accused her critics of perpetrating a “blood libel” against her, a remark widely condemned as anti-Semitic. Then she let down her supporters by relentlessly teasing a 2012 presidential run but ultimately opting out. For years, Palin’s political prowess has been a pale ghost of what it once was. Trump, however, changed that overnight by courting and accepting her endorsement, and he’s probably the only person on Earth capable of reviving Palin’s political fortunes. Here is a man 10 times more defiant, unconventional, and politically incorrect than Palin, who’s based her entire career on being defiant, unconventional, and politically incorrect. The absurdity of Trump suddenly makes Palin seem palatable and mainstream. For Palin, the benefit is twofold. Riding on Trump’s coattails obviously offers her a chance to enjoy the level of attention and relevance in the media that she once commanded but has since lost. Who wouldn’t want that? But there’s a more long-term prize Palin could win by endorsing Trump: a cabinet appointment in a Trump administration. Trump said back in July that he’d “love” to have Palin serve in some official capacity if he’s elected president, and Palin has openly expressed interest in being appointed Secretary of Energy. As preposterous as it may sound, there is a conceivable scenario wherein Donald Trump becomes President of the United States and Sarah Palin, after all of these years, is head of an executive-level agency in the White House. We’re not there yet, of course. But if Trump wins the Iowa caucuses, expect to see a whole lot more of Sarah Palin on the campaign trail. That goes double if he wins in a squeaker, because she could then plausibly claim to have put him over the threshold. In any event, we almost certainly haven’t seen the last of Palin this cycle, and as with so many other unexpected developments in the 2016 campaign, we have Trump to thank.